Numerous brands of cat food fill the shelves at supermarkets, pet food stores, discount warehouses, and superstores. Here's an overview of some of the top cat and kitten food companies. As we continue our search for the best cat food for your feline buddy, I thought I'd outline basic information for each of the companies I explore and put them here in this section. Pet food companies change ownership constantly, it seems, with smaller companies getting swallowed by larger players. In turn, some larger players are swallowing other larger players, or parts of the larger players. If you live in the U.S. and are like most other cat guardians, almost every product in your house can be traced back to fewer than 15 or so companies. We'll start out with a name I'm sure you know. 9Lives is famous for having a spokes cat, Morris. The original Morris was an orange tabby who, the story goes, was minutes away from being euthanized when animal trainer Bob Martwick saved him. That was in 1968. Martwick turned Morris into a celebrity cat through numerous 9Lives TV commercials, and Morris became one of the most famous cats in history. In part thanks to Morris, 9Lives is one of the most famous brands of cat food (and one of the most famous companies) in the world. 9Lives is owned by Big Heart Pet Brands, formerly the pet food division of Del Monte foods. The J.M. Smucker Company acquired Big Heart Pet Brands in 2015. Proctor and Gamble is another one of the top companies in the pet food industry. In 2014, Proctor and Gamble sold Eukanuba and the Iams cat food brands to Mars (worldwide) and Spectrum Brands (Europe). "Menu is a leading North American private-label/contract manufacturer of wet pet food products sold by supermarket retailers, mass merchandisers, pet specialty retailers and other retail and wholesale outlets." A lot of pet owners are concerned about the very public 2006 - 2007 recall of Menu Foods manufactured pet food. Many of us had probably never heard of Menu Foods until that recall. Those concerned with being environmentally conscious and those involved with animal rights have been urging pet owners to dig deeper into both how pet foods are manufactured, and the source of the ingredients. Just what is a safe cat food? Since Menu Foods manufactures dog and cat food for any of a number of companies (and this may change over time), it may be hard to know whether or not a company you're buying food from is using them. Even companies that claim to have natural or organic products may have some items manufactured by Menu Foods. More information is at the Menu Foods Pet Food Recall Page. Update (June, 2011): Menu Foods was sold to Simmons Pet Food company in August, 2010. The page that used to contain the recall information (www.menufoods.com/recall) no longer exists, as the domain menufoods.com now redirects to the Simmons website. That website, as of this update, appears to have no information on Menu Foods or any of the previous recalls. When a company with a bad reputation is purchased like this, there is often attempt to erase bad publicity by making it difficult to find the information. In this case, however, the information on the recall seems to be gone completely. In addition, the Simmons pet food company website used to list pet food manufacturing facilities at the former Menu Foods locations (Emporia, Kansas; Pennsauken, New Jersey; and Streetsville, Ontario). That information has been moved, and frankly, it doesn't pay for me to keep trying to chase it down as 1) they don't forward the link to the new location, if it exists, and 2) this information can change often and without notice. It's important that as cat food consumers, however, we understand who makes and is responsible for what goes into the brands of cat food that we feed to our pets. See the cat food recall list for more resources on ensuring better awareness and notification when there is a cat food recall. Born Free has a page on who makes some of the biggest brands of cat food, and other information on how pet food is made (PDF). Although it's dated (some of the companies have changed hands since it was written), it's a good introduction. Natura Pet Products makes (see update below) premium all-natural pet food with no chemical additives, by-products or fillers, under the brand names Innova, EVO, and California Natural. Their Innova line uses the USDA food pyramid and brings together ingredients from the five food groups: meat, dairy, vegetables, fruit, and grain. EVO is a high protien, low carb, grain-free cat food line (discontinued Summer, 2018), claiming the highest protein content of any meat-based dry pet food on the market. California Natural is a hypoallergenic pet food, claiming the shortest ingredient list of any dry pet food. They use only one protein, one fat and one carbohydrate source. Update: The Innova, EVO, and California Natural pet food lines have been discontinued. Despite being owned by Mars (and P & G prior to that), these brands claimed the cost of manufacturing a high quality pet food was too high. Well-known actor Paul Newman made the original company he co-founded instantly known and recognizable. Newman's Own Organics: The Second Generation is an off-shoot company run by Paul Newman's daughter, Nell Newman. They make both people food (their first product was a best-selling organic pretzel) and pet food from organic ingredients and their products are certified organic by Oregon Tilth. "Newman's Own Organics pet foods are complete and balanced and formulated to exceed the nutrient requirements established by the Association of American Feed Control Officials (AAFCO) Nutrient Profiles." "contains no rendered by-products, intestines, heads, feet or feathers." They use no wheat or corn products in their cat food, and instead use organic white and brown rice, organic barley, oats, sorghum and millet, and organic peas and carrots. More about Newman's Own cat food. "Eliminate over 1,000 doses of antibiotics fed to chickens. Provide over 40 pounds of great-tasting natural chicken to your cat." Pet Promise is a pet food company that offers high quality meat protein for cats and dogs. They use real meat and poultry, sourced from farms that raise their animals with no added growth hormones or antibiotics. They use no meat or poultry meals (no rendered meat) and no byproducts meals to make their cat food. 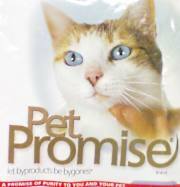 Update: The Pet Promise brand has been discontinued. As of January 2010, Pet Promise was longer be available for sale. If you know of an alternative product that you think is of quality, please add your cat food review to the site for other cat guardians to read. You'll often see many of these on either grocery store or super-store shelves.